Waikato Cardiothoracic Unit is proud to be convening the 2019 Tongariro Meeting. 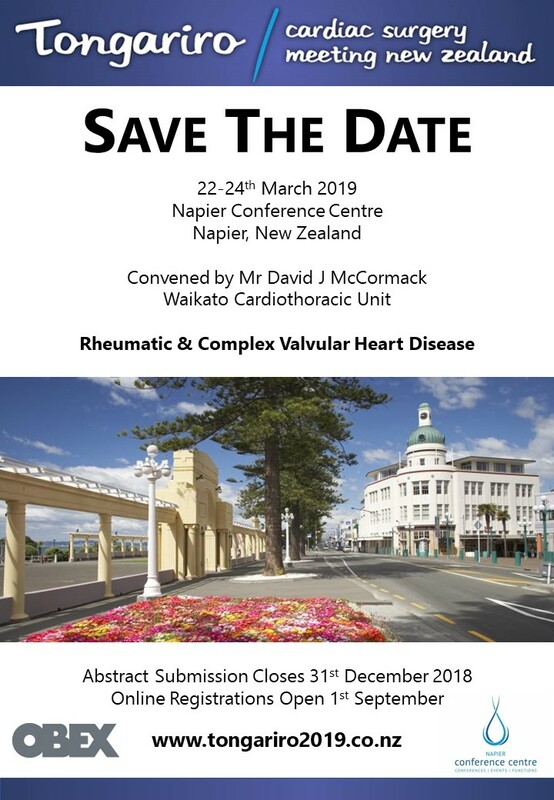 The event will be held on 22nd to 24th March 2019 in Hawke's Bay. The focus of the meeting will be 'Rheumatic and Complex Valvular Heart Disease'. We strive to bring clinicians relevant to the important condition together in conversation to support and advance contemporaneous practice. We will combine expert presentations with lively debate. Interactive WetLab and simulation stations will bring further life and energy to the meeting. In addition to the central plenary sessions there will be breakaway sessions to tackle in-depth specialist subject matter. We welcome surgeons, anaesthetists, intensivists, perfusionists, nursing staff and undergraduates. If you are involved in care of patients with valvular heart disease - this meeting will be extremely interesting to you.